A: There are those who suspect Wildflower Center volunteers Nan Hampton, Jimmy Mills and Barbara Medford to be the culpable and capable parties. Yet, others think staff members Damon Waitt, Joe Marcus and Philip Hawkins might play some, albeit small, role. You can torture us with your plant questions, but we will never reveal the Green Guru's secret identity. 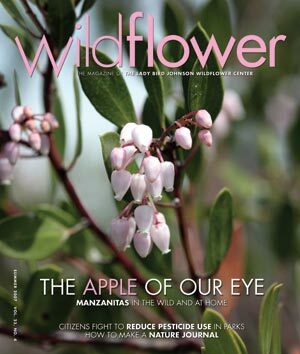 Support NPINHelp grow the Native Plant Information Network by giving to the Plant Database Fund or subcribing to Wildflower magazine. Mr. Smarty Plants would give Wildflower magazine two thumbs up...if he had two thumbs. I have a Lantana Tree that grew beautiful over the summer, now Winter is coming and I don't know what to do with this tree, I live in Monroe, New York. Could you please help me out. Thank you. Two Questions: Is the weather too cold to plant red tip photinias in Monroe NY? What is a good alternative evergreen shrub to hide chain link fence? We lost a large number of trees in the forest adjacent to our home, and I plan to replant them. What species do you recommend to plant the area with natives and to keep it looking "natural." I have an area that is in semi-shade but gets about 4-5 hours of sunlight in the summer. Instead of grass I would like to perhaps use wild flowers or even prairie type grasses. Any suggestions?? I am looking for bracken fern plants to plant in my garden. Where can I find them? Need suggestions for privacy hedge in Northern NJ. Looking for suggestions for the easiest natives to grow in containers.